ONLINE BOOKINGS HAVE CLOSED FOR THIS EVENT. WALK-INS ARE WELCOME. 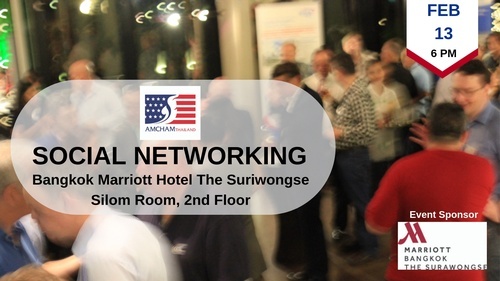 AMCHAM Thailand invites you to an evening of networking and socializing at one of Bangkok's newest hotels. Our host venue invites you to discover Thailand culture, cuisine, history and architecture with sleek, modern style and 5-star service at this luxury hotel. At this month's event, you'll also have the opportunity to win 2 tickets to superstar comic Jim Gaffigan's upcoming Bangkok appearance in March on his Quality Time Tour. Members must be present to win. Entrance fee includes a selection of mouth-watering foods, and free-flow wine and beer. Proceeds from our networking events go to support the American Chamber of Commerce in Thailand Foundation Scholarship Program.